Consumers love buying in bulk. Saving money and cutting down on trips to the store is a no brainer. And retailers, from the mom and pop grocery store, to big box stores, to buying clubs, are happy to offer multi-pack products. So how can you get in on this trend? Maximize your sales and grab attention with Do-It carry handles. Do-It carry handles make bulk buying even easier for customers, and are a fully customizable with your branding. Better to buy bulk. Consumers are happy to buy bulk because they know they’re saving money. 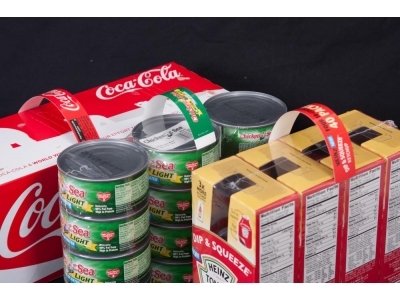 A quick internet search will show lots of articles on the savings, and stocking up on essentials like beverages, snacks, and toilet paper means less trips to the store for these items you’re sure to use up. Better to sell bulk. Don’t sit on product. Actual profit, not percent profit, is what you’re looking for. Bulk products give a better profit margin because they spend less time on the shelf or the store room, and take less labor to get out the door. How to handle those bulk items? Do-It carry handles! Our handles provide a positive branding experience by making transport that much easier for consumers. They can be printed with your products branding – or with your retail outlets branding. Do-It carry handles come in a variety of lengths and sizes. Either loose or on rolls, they are applied in the factory, contract packaging facility, or even in the store. Different models can hold a recommended product carry weight between 15 – 35 lbs. Review our specifications for a variety of lengths, widths, and gauges so that you can find the right one for your product. Give your customers an extra hand. For anything from canned food to condiments, Do-It carry handles make bulk buying easier.